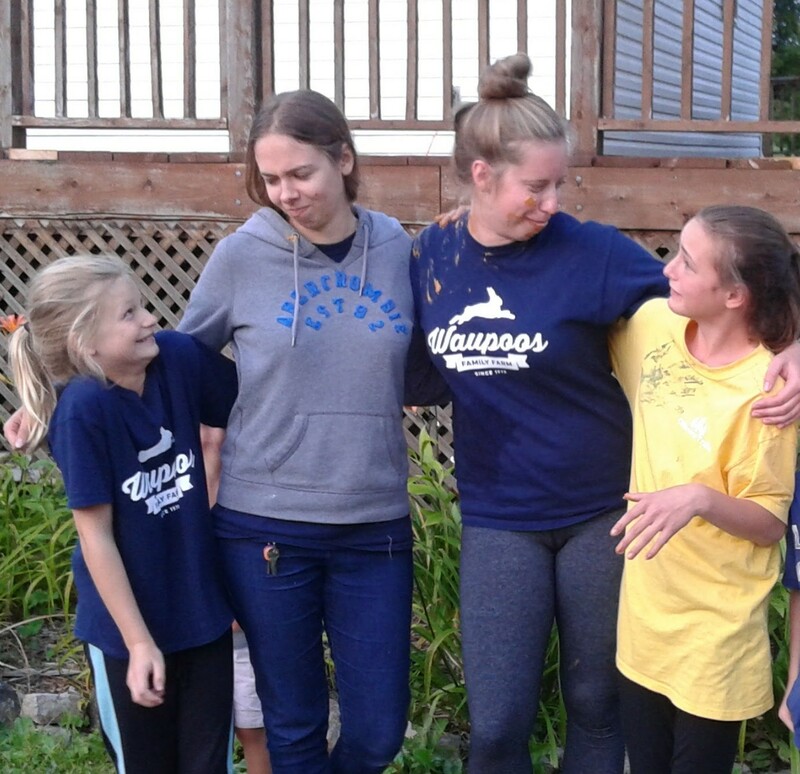 We are now ending our final week of the summer session at Waupoos, and though we’re a little sad to be finished, this week has been an amazing end to the summer! We were lucky to have our awesome hosts, Lori and Kim, back for week eight! As usual, cottagers had lots of fun activities and crafts to keep them busy. We had excellent cottager participation which added even more energy to our incredible activities. Throughout the week, we enjoyed pancake breakfasts, a hotdog lunch as well as delicious cupcakes! Our cottagers also tested their crafting skills with bracelet making and painting! Chapel time was kept exciting with Chapel Cranium, Saint Jeopardy and a Prayer Chain with over 90 intentions! 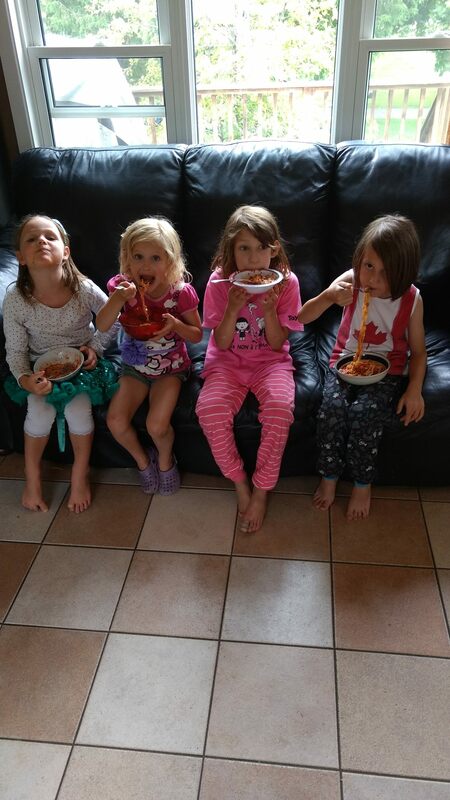 The kid’s favourites, Amazing Race and Story time, continued to be a hit! The talent show was full of excitement this week, with awesome participation from both cottagers and residents. All four staff members also decided to stick around for the last talent show of the summer, and we even put in a few acts of our own! The resident girls took great pleasure in acting as our arms to make and feed us peanut butter sandwiches (most of which didn’t quite make it to our mouths). Overall, the week has been so much fun, and a great way to end off our summer here. We want to thank all of those that have been involved at Waupoos for helping to make this summer amazing: The cottagers who are unique, inspirational, and always ready to have fun, the farm families who put so much work into keeping Waupoos up and running, and of course all of the children whom we have grown VERY fond of over the last eight weeks. The excitement of the summer is not over yet, and we hope you will join us for our last Open House, this Saturday August 26th at 1pm! It seems that summer has gone by in the blink of an eye as we finish up our seventh week here at Waupoos! Our amazing host family this week brought some fun and creative ideas that always kept the kids excited for the next activity. On Tuesday we endured the rain by playing the kids’ favourite Madlibs, settling in for storytime, and finishing off with a few mystery games. On Wednesday, everyone was invited to a birthday party… where it was everyone’s birthday! The party-goers enjoyed fun party games, cupcakes, loot-bags, and lots of popcorn! There was more fun to be had on Thursday with Bingo, parachute games, and painting. Tomorrow the kids are looking forward to creating their very own volcano! Overall, this week was filled with fun because of our energetic host family and their amazing ideas. We can’t believe that next week is our last week of the summer, but have high hopes that it will be a week to remember! Please join us for one of our last Open Houses, this Saturday, August 19th at 1 pm. There will be swimming, wagon rides, games, and a potluck. Hope to see you there! We are just coming to the end of another wonderful week at Waupoos, filled with fun, sun, and smiling children! This week we were lucky to have an amazing host family, who were constantly planning fun activities for the kids. Some highlights of the week included sports like soccer and ultimate frisbee, a delicious pancake lunch, crafts, and even a carnival day on Friday where the kids got to play all sorts of games to win tickets, which they later traded in for prizes. Meet the Animals was a big hit as usual, as was Storytime with our two wonderful library volunteers. The staff also organized a few water activities, like a slip and slide and a water obstacle course, to keep the kids cooled off. Overall it was an amazing week, and we are all sad to see it end (but looking forward to what the final 2 weeks of summer will bring!). We hope to see you all at our Open House, this Saturday August 12th at 1 pm, for swimming, wagon rides, and our weekly potluck! 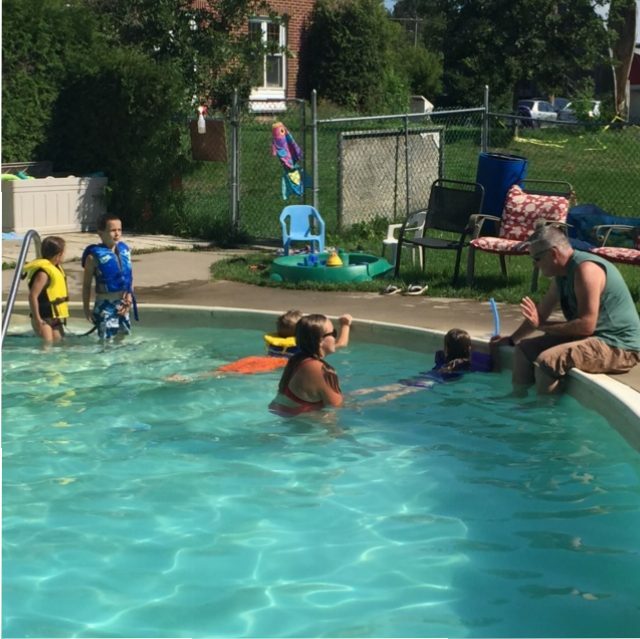 The fun never stops at Waupoos and Week #5 was no exception! With lots of cottagers and hot weather, the pool was always busy and the activities were always exciting! This week at Waupoos, our staff transformed into hosts for our game show themed week! The cottagers demonstrated their strength, speed and agility with our Wipeout Zone and Waupoos Ninja Warror. Their skills and knowledge were put to the test during Waupoos Jeopardy and Masterchef (where we made pizzas from scratch)! On Friday, cottagers worked together to complete challenges all around the farm for the second Amazing Race! Time truly flies when you are having fun, and as we wrap up Week #5, we are wondering where the summer has gone! We hope to celebrate this amazing week with you at our Open House this Saturday! Join us at 1pm for swimming, wagon rides, a potluck and much more! The summer is officially half way done at Waupoos and we can’t believe it is going by so quickly! With no host family this week, the Waupoos staff have been busy running activities! We decided to add a theme to Week 4: All Around the World! Each day, our cottagers traveled to a different country. We started on Tuesday in Canada with a pancake breakfast and a classic game of ball hockey. On Wednesday, we traveled overseas to Italy, where the kids transformed eggs and flour into homemade pasta and finished off the afternoon with a game of football (soccer). Finally, on Thursday, we visited Ireland for some shamrock crafts and Irish dancing lessons taught by resident Maria. The Amazing Race will be coming to Waupoos on Friday, where the cottagers will travel all around the world! We are looking forward to the second half of summer, and we know it will be filled with fun, amazing people, and, hopefully, lots of sun! We hope you can join us on Saturday, July 29th at 1 pm for our open house where there will be swimming, a wagon ride, and our weekly potluck! The sun finally joined us at Waupoos for our third week! We definitely took advantage of the nice weather and had lots of fun in the sun! We had yet another amazing host this week! 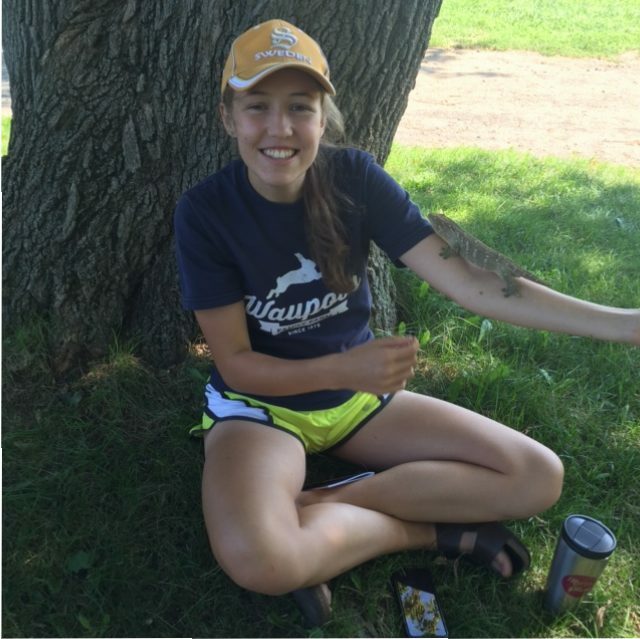 With lots of different and exciting activities, no one is bored at Waupoos! The kids took part in crazy obstacle courses, a yummy ice cream station, and a creative craft! 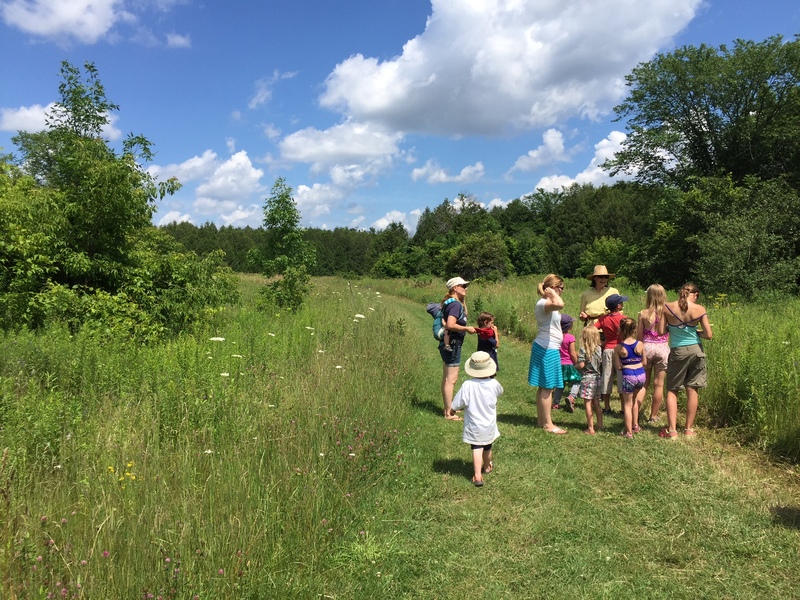 We had an incredible nature walk through the Waupoos property where we learned about the yummy and helpful plants all around us! The pool was always busy with lots of cottagers trying to beat the heat! The Weekly Waupoos Talent Show was another huge success with everyone showing their amazing unique talents! After this busy and fun filled week, we look forward to celebrating with you at our Open House on Saturday, July 22nd. Join us for mass, wagon rides, swimming and a potluck! Despite a lot of rain and clouds, we have had a lot of fun during Week 2 at Waupoos! Our host family has transformed our cottagers into Picassos with lots of crafts and expert painting. With freshly baked cookies, muffins and pancakes, the lodge always smelled great and cottagers were always happy. Rain or shine, there was no shortage of happy (and cold) swimmers in the pool. 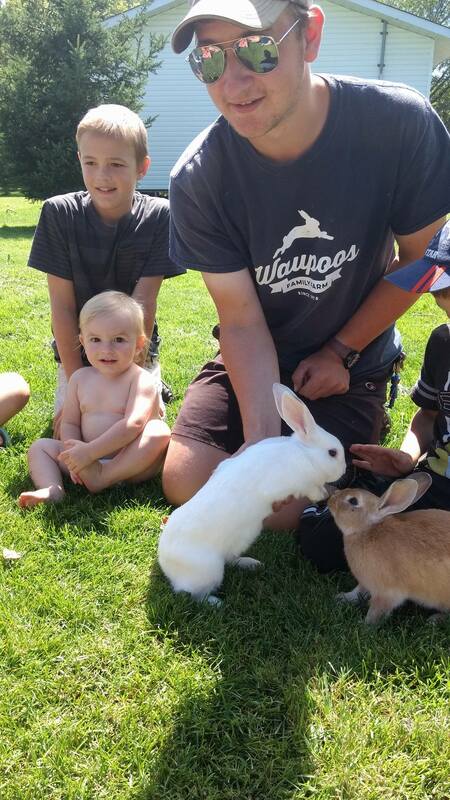 Our Waupoos bunnies stole the show at Meet The Animals where they received lots of love from all the kids. We also kept busy with fun games and skits in chapel, a Scavenger Hunt, Bingo and a dance party! Face painting was a favorite this week with our artist, Sabrina, spending 2 hours creating beautiful butterflies, scary monsters, and adorable characters! We hope to see you all at our Open House on Saturday at 1 pm for swimming, wagon rides, potluck and lots of fun! Our first week of the summer session is flying by, and this week has been a blast so far! Our amazing host family has planned a variety of fun activities including bingo, and cookie making! Throughout the week we’ve found some new and creative ways to keep cool in the hot weather: water Olympics, jump-rope, water-kickball, and duck duck SPLASH! The kids have been keeping busy making beautiful artwork, expanding their vocabulary with their new favorite, Madlibs, singing and dancing their way through chapel, and of course preparing for the weekly talent show. 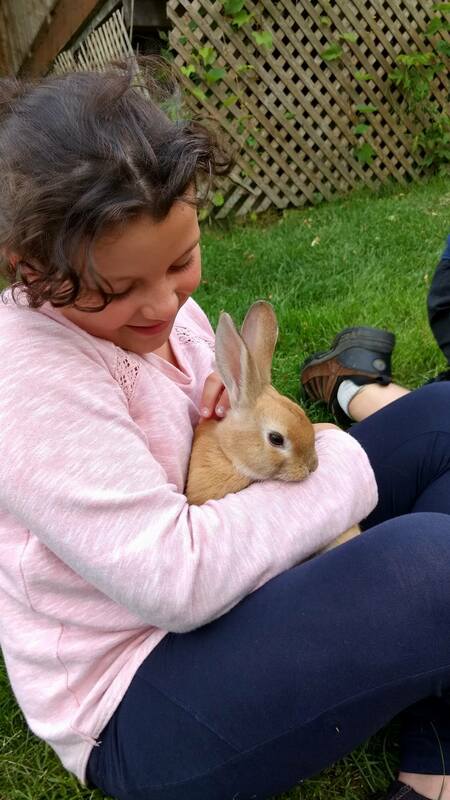 The animals have been getting their fair share of attention, especially during Meet The Animals on Tuesday! Rain or shine, there is still more fun to be had at Waupoos this week. With campfires and wagon rides, there is never a shortage of smiles and excitement! We hope to see you for our Open House, this Saturday at 1:00 pm! This past Thanksgiving weekend was a great success! We had full cottages, many eager children, new faces, and the biggest Thanksgiving potluck in the known history of Waupoos! There was a ton of great food and a ton of folk to eat it! By the end, there were only a few crumbs let for the pigs. Thank you all for the great weekend! The last week of summer is quickly coming to an end. Where has summer gone? It feels like just yesterday we were busy on our first week getting the cottages ready for cottagers. We’ve had so much fun this summer and have made some amazing memories. We want to thank all the cottagers and everyone along the way who’s made our summer so awesome. This week has been a terrific week to end on. Our host mom and daughter have planned so many interesting activities and there’s been no shortage of fun. On Tuesday, we met the animals and went on a hike. We were lucky and didn’t run into too many mosquitoes and we even saw a baby frog. Yesterday, the host family ran singing lessons which was super fun. We hope to see cottagers putting the lessons to use and performing in the talent show tonight. This week Ray’s Reptiles was a blast. We saw so many cool animals and the kids loved it. This Saturday is the last open house of the summer and you won’t want to miss it. The open house starts at 1pm and ends with a potluck at 6. Be sure to bring yourself, bathing suits, something for potluck and get ready to have some fun. We hope to see you there!